Pastry: place flour, cinnamon, icing sugar and butter in a food processor, and process until the mixture resembles fine breadcrumbs. Gradually add the water (you might not need all of it) and process until the mixture starts to form a dough. Gather dough into a ball, flatten into a disk, wrap in plastic wrap and chill for 1 hour. Make the filling: place the apples in a large saucepan with the butter and water. Place over low heat and cook, stirring occasionally, for 15-20 minutes or until the apples are soft and the liquid has been absorbed. Cool slightly then stir in the dulce de leche. Preheat oven to 180°C/350°F. Grease a 6-hole Texas muffin pan, then line the holes with baking paper. Roll out the pastry on lightly floured surface and cut out six 12cm circles. Bring the remaining pastry together and roll out again. Cut out six 6cm circles. Press larger pastry circles into the lined muffin holes. Fill with the apple mixture. Brush edges with egg, then top with the smaller pastry circles and gently press together the pastry edges to seal the pies. Use any leftover pastry to decorate the tops of the pies, then brush with egg. Sprinkle with the sugar and bake for 20-30 minutes or until golden. Stand for 10 minutes in the pan, then carefully unmold onto a wire rack. I guess that using tartlet pans with removable bottoms would work better. 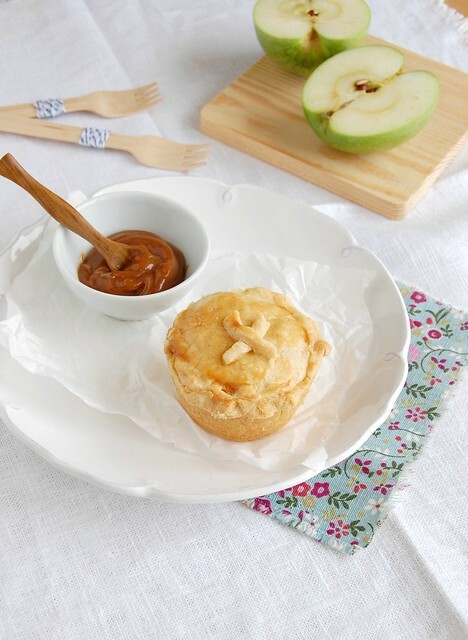 I love dulce de leche and apple desserts - these pies are the cutest! Oh! This recipe got my little girl excited and me busy in the kitchen.. This sounds delicious!! I need to get my hands on some dulce de leche to make these apple pies. OMG, I CAN just see what a winner this recipe is. Must give it a go.